Pamela for Skype for Windows 10 - a set of modules to extend the basic functionality of skype messenger. 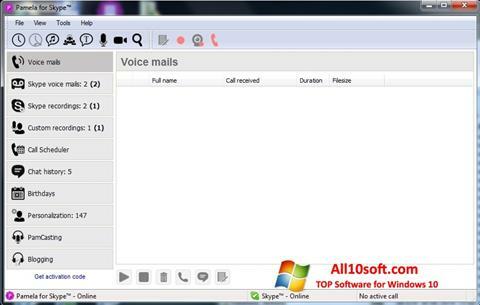 The application can record audio and video calls, can be used as an answering machine with video messaging function, store the history of correspondence on the cloud service, allows you to redirect calls to landline numbers. The program is able to show birthday reminders, allows you to change the status during a call, broadcast the desktop, scale the transmitted stream and apply filters. Uses system tray to control settings, can encrypt traffic when making calls. You can free download Pamela for Skype official latest version for Windows 10 in English.